The secretary met with monument backers, but most meetings were with advocates of changing or rescinding the designations. Trent Nelson | The Salt Lake Tribune People hold signs up for passing vehicles at a Monument Rally and Business Owner's Press Conference in Kanab, Wednesday May 10, 2017. The event was planned to occur in conjunction with Interior Secretary Ryan Zinke's visit to Grand Staircase-Escalante National Monument. Trent Nelson | The Salt Lake Tribune People hold signs up for passing cars at a Monument Rally and Business Owner's Press Conference in Kanab, Wednesday May 10, 2017. The event was planned to occur in conjunction with Interior Secretary Ryan Zinke's visit to Grand Staircase-Escalante National Monument. 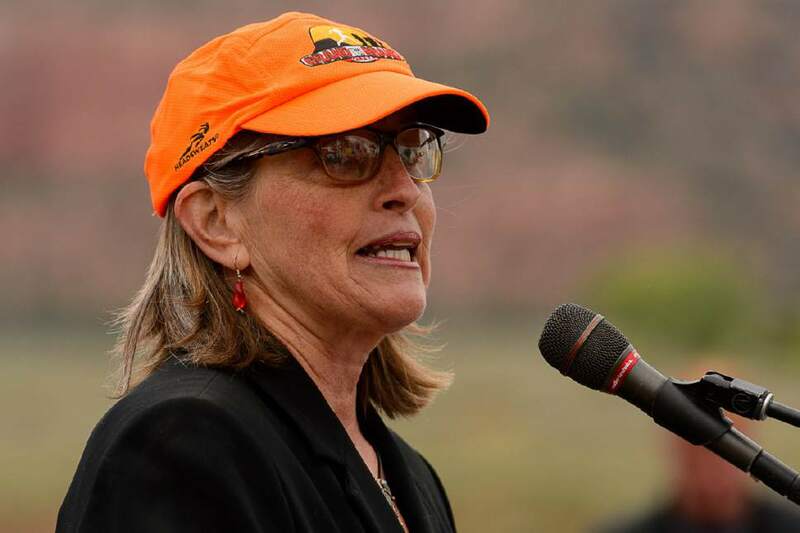 Trent Nelson | The Salt Lake Tribune Susan Hand speaks at a Monument Rally and Business Owner's Press Conference in Kanab, Wednesday May 10, 2017. The event was planned to occur in conjunction with Interior Secretary Ryan Zinke's visit to Grand Staircase-Escalante National Monument. Trent Nelson | The Salt Lake Tribune Victor Cooper speaks at a Monument Rally and Business Owner's Press Conference in Kanab, Wednesday May 10, 2017. The event was planned to occur in conjunction with Interior Secretary Ryan Zinke's visit to Grand Staircase-Escalante National Monument. Trent Nelson | The Salt Lake Tribune People hold signs up for passing cars at a Monument Rally and Business Owner's Press Conference in Kanab, Wednesday May 10, 2017. The event was planned to occur in conjunction with Interior Secretary Ryan Zinke's visit to Grand Staircase-Escalante National Monument. Trent Nelson | The Salt Lake Tribune Cyrus Mejia speaks at a Monument Rally and Business Owner's Press Conference in Kanab, Wednesday May 10, 2017. The event was planned to occur in conjunction with Interior Secretary Ryan Zinke's visit to Grand Staircase-Escalante National Monument. 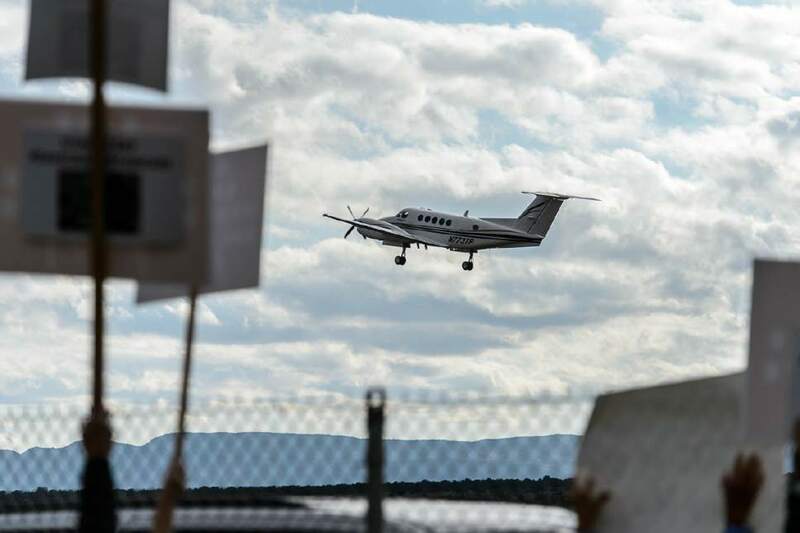 Trent Nelson | The Salt Lake Tribune Protest signs frame a plane taking off from Kanab Airport following a news conference with Secretary of the Interior Ryan Zinke, Wednesday May 10, 2017. 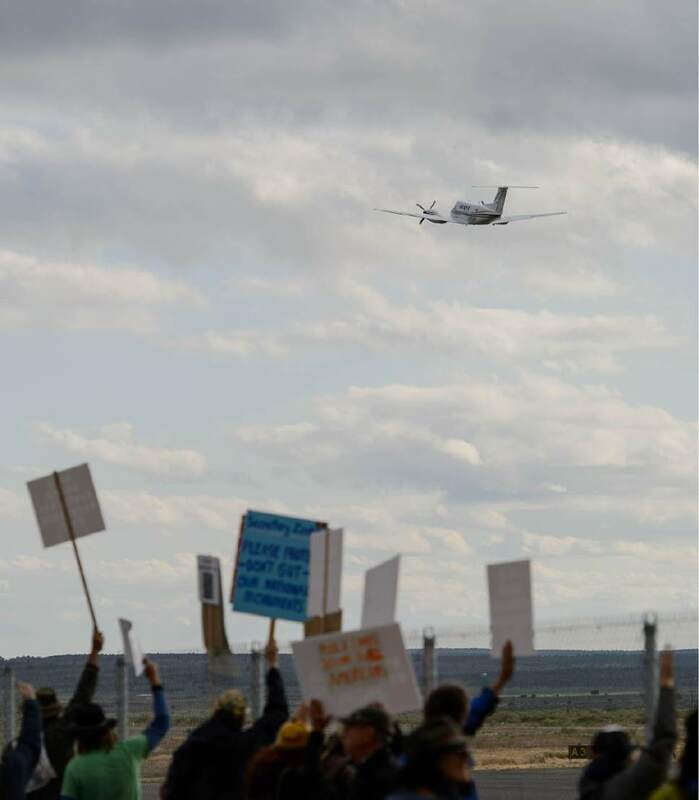 Trent Nelson | The Salt Lake Tribune Protest are held aloft as a plane takes off from Kanab Airport following a news conference with Secretary of the Interior Ryan Zinke, Wednesday May 10, 2017. 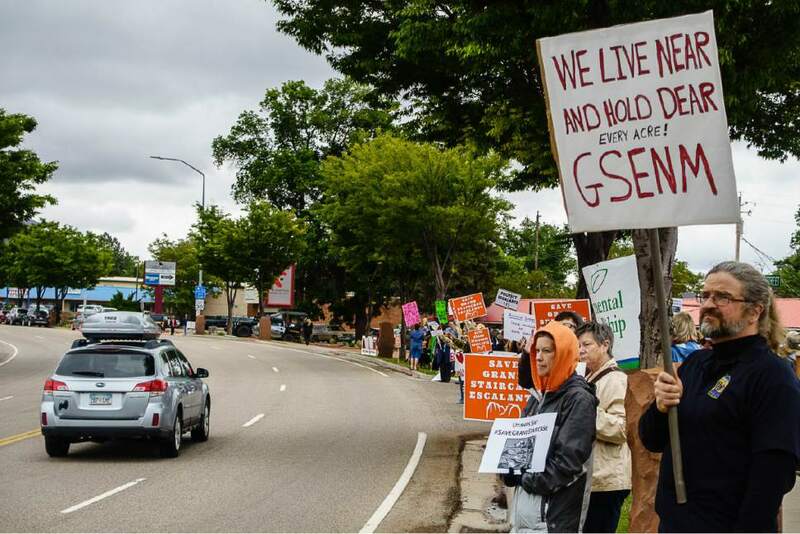 Trent Nelson | The Salt Lake Tribune People hold signs up for passing cars at a Monument Rally and Business Owner's Press Conference in Kanab, Wednesday May 10, 2017. The event was planned to occur in conjunction with Interior Secretary Ryan Zinke's visit to Grand Staircase-Escalante National Monument. Trent Nelson | The Salt Lake Tribune People hold signs up for passing cars at a Monument Rally and Business Owner's Press Conference in Kanab, Wednesday May 10, 2017. The event was planned to occur in conjunction with Interior Secretary Ryan Zinke's visit to Grand Staircase-Escalante National Monument. Trent Nelson | The Salt Lake Tribune Secretary of the Interior Ryan Zinke, right, speaks at a news conference at the Kanab Airport, Wednesday May 10, 2017. Standing with him were Rep. Chris Stewart and a group of county commissioners. Trent Nelson | The Salt Lake Tribune Secretary of the Interior Ryan Zinke speaks at a news conference at the Kanab Airport, Wednesday May 10, 2017. Standing with him were Rep. Chris Stewart and a group of county commissioners. Trent Nelson | The Salt Lake Tribune Secretary of the Interior Ryan Zinke leaves a news conference at the Kanab Airport, Wednesday May 10, 2017. 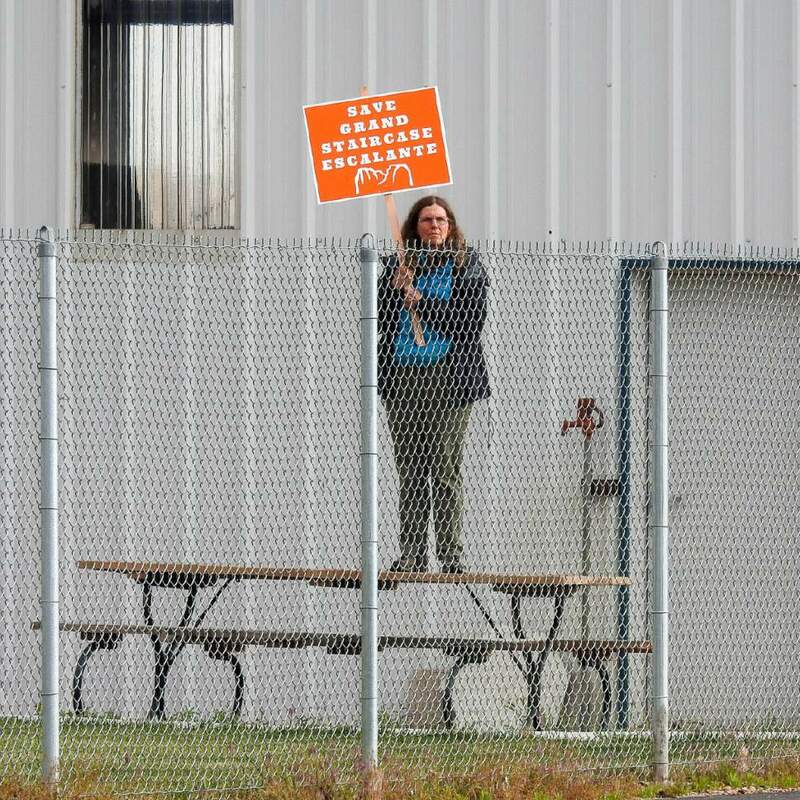 Trent Nelson | The Salt Lake Tribune A protestor holds up a sign reading, "Save Grand Staircase Escalante" as Secretary of the Interior Ryan Zinke prepares to depart the Kanab Airport, Wednesday May 10, 2017. 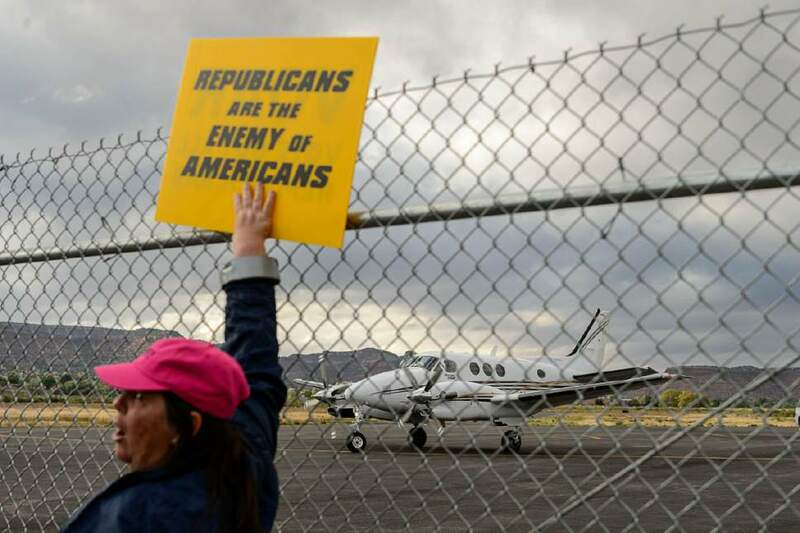 Trent Nelson | The Salt Lake Tribune A protestor holds up a sign reading, "Republicans are the enemy of Americans" as a plane prepares to deaprt following a news conference by Secretary of the Interior Ryan Zinke at the Kanab Airport, Wednesday May 10, 2017. Kanab • Surrounded on the tarmac by an entourage of national monument opponents while full-throated advocates tried to drown him out from the runway fenceline, Interior Secretary Ryan Zinke said Utahns had been granted a voice in the future of their public lands. He&apos;d heard from Utah&apos;s delegation, its governor, county commissioners, pro-monument groups and American Indians on both sides of the debate, he said. And the 100 or so people chanting "Talk to us!" as he spoke? "If I missed one group," he shrugged, "that&apos;s the breaks." Zinke&apos;s outing Wednesday at Grand Staircase-Escalante National Monument concluded a four-day Utah tour that will inform a recommendation to President Donald Trump: Rescind, redraw or leave alone the Grand Staircase and newly designated Bears Ears monuments. "We&apos;ll see," he said when asked about the likelihood that he would recommend a change that some legal scholars doubt Trump has the power to make. 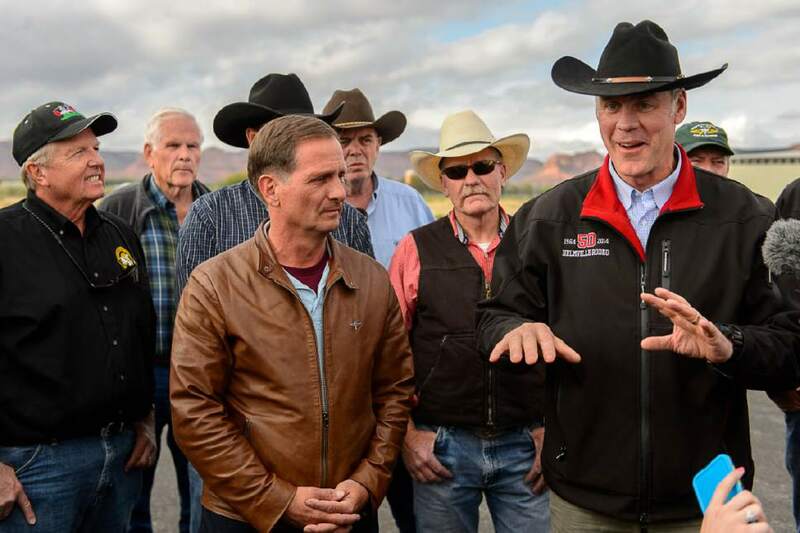 Zinke held two publicized meetings with pro-monument activists during his visit  the Bears Ears Inter-Tribal Coalition and Friends of Cedar Mesa  for a total of about an hour and a half, while he traveled extensively with anti-monument heavyweights. He offered little media availability outside of daily briefings, and no public meetings. 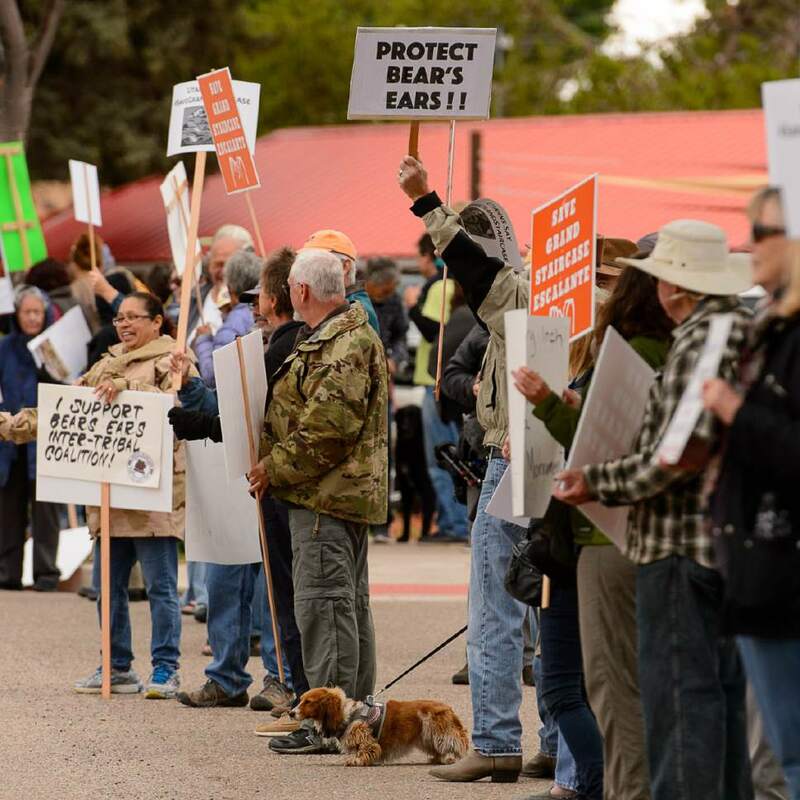 By contrast, predecessor Sally Jewell invited the press to accompany her on most legs of a July 2016 Bears Ears visit that concluded with a three-hour public hearing in Bluff. Her trip to Utah preceded President Barack Obama&apos;s December designation of Bears Ears as a national monument. 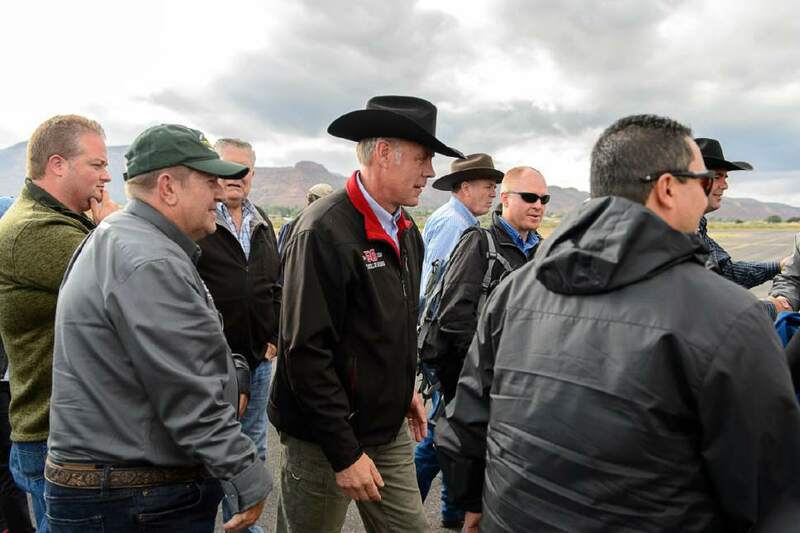 On Wednesday, business leaders from Escalante and Boulder again were thwarted in their attempt to land a face-to-face meeting with Zinke, where they would have told him that area businesses are thriving in part because of the 1996 monument designation there. 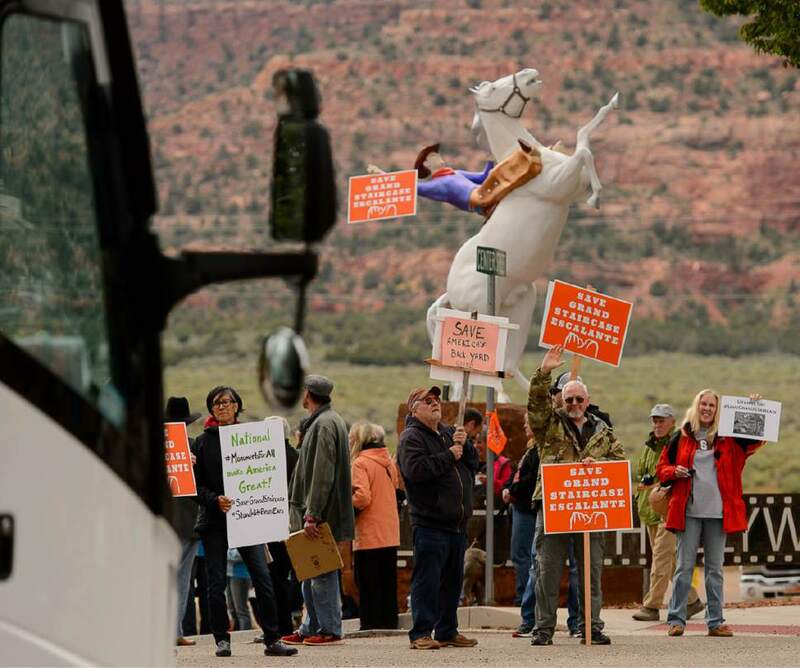 But state Rep. Mike Noel, R-Kanab, said Zinke&apos;s predominantly anti-monument company didn&apos;t "tell him what to do" about their concerns, which he said include access to roads, the need for large groups of visitors to obtain permits, and preservation of multiple uses for the land. "We&apos;re showing him and saying, &apos;Mr. Secretary, we&apos;re going to show you this, we&apos;re going to show you some of the things that we think are bad and we&apos;re going to show some of the things we think are really good,&apos; " Noel said. Utah&apos;s elected officials have argued that monument designations led to excessive restrictions on public lands and harmed neighboring economies, often citing the 1.9 million-acre Grand Staircase as an example. Gov. Gary Herbert has termed it the "poster child for federal overreach." Though studies by Headwaters Economics and Utah State University have shown little to no evidence that the monument has negatively affected area trends, state legislators and county commissioners recently passed legislation in support of shrinking its boundaries. 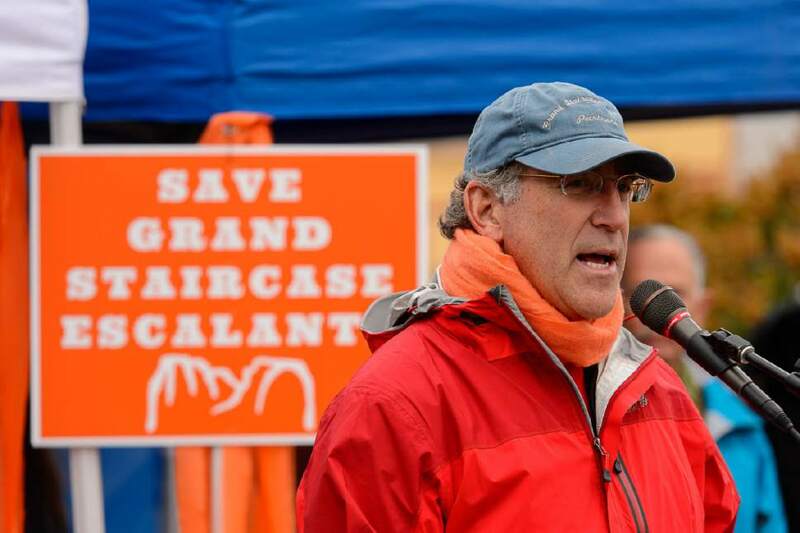 If the lifespan of the oldest layers of exposed rock in the Grand Staircase were expressed in human terms, its 20 years as a monument would be just a few minutes, Zinke&apos;s one-day visit Wednesday, less than the blink of an eye. A spring bloom provided a bright counterpoint Wednesday to its succession of washed-out cliffsides, prized by geologists and paleontologists as a window into Earth&apos;s distant past and key periods in the history of life. Zinke&apos;s comments touched on the area&apos;s beauty, his perceived prevalence of invasive knapweed and the avowed geologist&apos;s surprise when monument paleontologist Alan Titus told him that he had, in fact, seen fossils that were found in a coal seam. His first stop Wednesday was a short hike to the once-proposed Smokey Hollow Mine on the Kaiparowits Plateau, where Noel told him that while working for the Bureau of Land Management, he oversaw a "bulletproof" environmental impact assessment on a project that would have yielded about 9 billion tons of high-quality coal, hundreds of jobs and untold millions of dollars. What happened instead, Noel said, was that President Bill Clinton and Vice President Al Gore stood on the southern rim of the Grand Canyon in Arizona and sealed that coal into the cliffside by signing their proclamation. All, he said, to win an election. Noel told the people around him that they could learn more by reading Republican Alaska Rep. Don Young&apos;s House report "Monumental Abuse," and Zinke later indicated that he had. "If you read Congressman Young&apos;s report, there&apos;s strong evidence that a lot of it was political," said Zinke, in an interview with The Salt Lake Tribune atop the plateau, not far from where a coal seam still smolders after its ignition thousands of years ago. 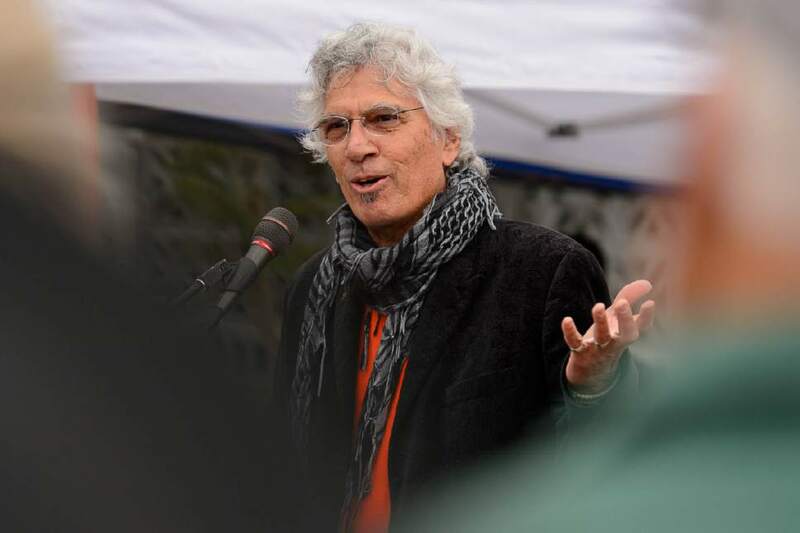 "Politics should not play a role in determining a monument," he said. Later, at the airport, Zinke said of the Grand Staircase to "remember, when this monument was formed, the governor of Utah read it in the paper." "This is the first time in a monument that we&apos;ve given the public a say," he said. Zinke said that those shouting nearby  one bellowed, "You can hear me! I&apos;m sure," to laughs  were not protesters but "advocates," and that all he encountered on his trip had been "friendly." "If you move away from the cameras and move away from people trying to make a point and just talk to people, which I&apos;ve done, it&apos;s remarkable that both sides are almost universally the same on priorities: protection of the cultural resources, protection of culture, love of the land," he said. "There&apos;s a strong middle ground." Blake Spalding, who has lived in Boulder year-round for 18 years and co-owns the thriving Hell&apos;s Backbone Grill, said she was "halfway froggy" after trying to share her message 100 yards away from the secretary, who was "rude," she said, not to meet with her. That message: The monument&apos;s supposedly devastating economic impact on the region is a false narrative. "We are awash in jobs," she said. "What we need is people to fill them." 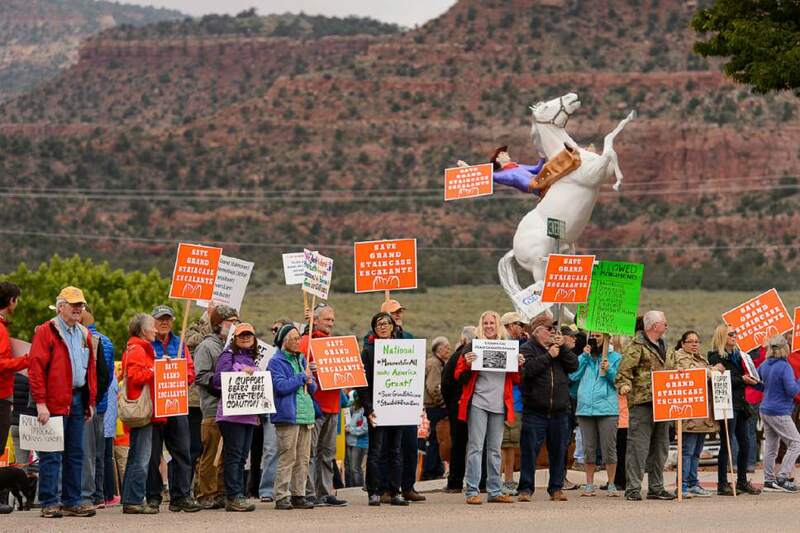 The 49 members of the Escalante-Boulder Chamber of Commerce expressed unanimous opposition to downsizing the monument in a poll from President Dennis Waggoner. Their frustrations in trying to secure a meeting with Zinke mirrored those expressed earlier this week by Utah Dine Bikeyah, a Navajo nonprofit at the heart of an effort to conserve sacred lands and artifacts in the Bears Ears region. The Center for Western Priorities released a statement Wednesday in which Deputy Director Greg Zimmerman called Zinke&apos;s visit "amateur hour." 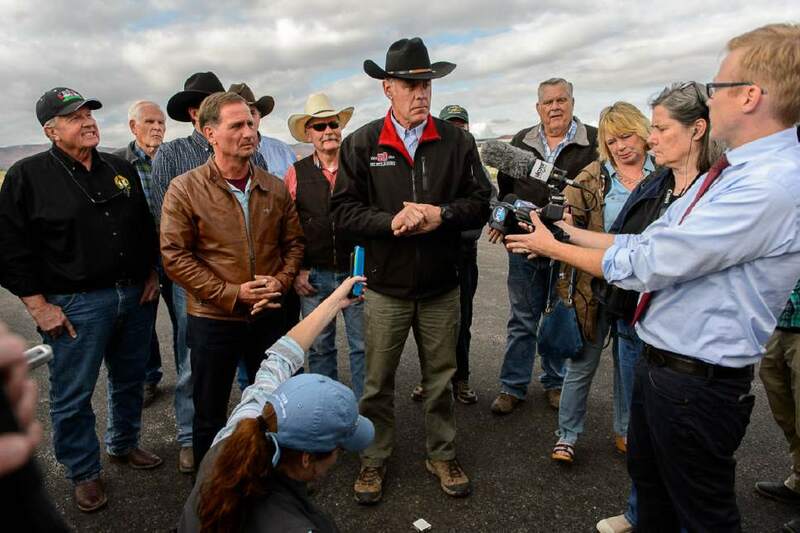 "Zinke&apos;s one-sided listening tour amounted to little more than a series of staged photo ops with national monument opponents, while the loud pleas from the local monument supporters fell on deaf ears," he said. U.S. Sen. Martin Heinrich, D-New Mexico, said a public comment website touted repeatedly by Zinke was insufficient for the many area American Indians who lack internet access or are more accustomed to oral traditions. Heinrich further asked Zinke to extend the public comment period from 15 to 60 days. "I know you come to this office with a history of respecting and understanding tribal traditions and I hope you will work to ensure full engagement with tribal communities on the question of the monument&apos;s future before completing your review," he wrote. Utah Sen. Mike Lee and Rep. Chris Stewart praised Zinke, meanwhile, for what they felt was a thorough review. "I&apos;ve heard from Blanding rancher Kenny Black, all the commissioners from San Juan, Kane and Garfield counties, and also the Stewards of San Juan," Lee wrote in a news release. "Sec. Zinke has heard these Utahns explain how Obama&apos;s monument is hurting their lives, and I am hopeful that Zinke will address this issue by fully rescinding the designation." Zinke has until June 10 to offer a report on Bears Ears and four months to review Grand Staircase and 25 other large monuments designated since 1996.